True, we are a hockey family…but that is by default. Actually, no, I take that back, it is my fault. If I had been paying attention and fallen in love with a basketball guy, we would most certainly be a basketball family. But, you can see how that story ended up, and I am destined to spend my life in sub-zero arenas at the crack of dawn. Believe me, I’ve tried. We have three basketballs and I take the kids out to work on their dribbling. Big Sprout can actually shoot hard enough to play horse and around the world with me, and I have not given up hope that someone in this house will beg to play basketball. I take them to watch their friends play, looking for a spark of interest, and I would do everything I could to make basketball happen if they asked. 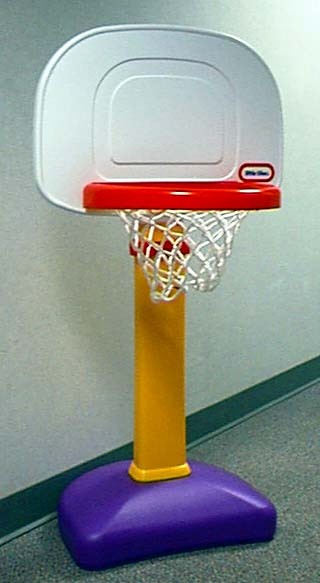 I played basketball growing up, starting in probably third grade, and through high school. I even played for one year in college. A big part of me could argue that basketball was the sport I loved, but soccer was the sport that took me the furthest. So I have never fully abandoned my passion for basketball, and each year about this time, I get excited about the NCAA basketball tournament. I admit that I know very little about the teams who have toiled and worked so hard to be counted among the sixty-four, but I will become an immediate fan at the first tip-off. Everyone in our house filled out a bracket this year…my attempt to recreate what my husband and I have occasionally experienced in Vegas. Nothing is quite like Vegas during March Madness, but we will make the most of it here too. Middle Sprout picked her teams based on the names. If the name of a team sounded like or was the name of a friend of hers, or a place she knew…they got the nod. Her final four picks are: Northern Iowa, Wisconsin, Minnesota and Saint Mary’s. Little Sprout made her picks similarly, high-fiving her sister each time she accidentally picked the same team. She belly-laughed at the Butler match-up. “Yeah…maybe their mascot is the Butts,” Big Sprout chimed in. “What about between Sam-Houston and Baylor?” I asked Little Sprout. Big Sprout was much more methodical. He studied the regional rankings and tried to pick who sounded like the strongest team. The mistake too many of us make who don’t really know these teams. I know my bracket will be wrong and I’ll excitedly cheer for teams I didn’t even know existed, but that is the joy of March Madness. March Madness rocks because of the comebacks…the last-second wins…the multiple overtimes and the emotion that comes with all of it. These college basketball players are the best players to watch. They have skill, talent and an unbridled passion for a game that I still love too. Some drama, for sure, but for me it is not at the disappointing level of the pros. No, I am not going to tell you my picks yet…but I’ll let you know who makes out the best in the Frank household. For now, we are preparing for the beginning of our weekend as a basketball family. I'm with the sprouts. Go Butts!! What a cute post! Thanks for visiting me and I'm following you now!! Looking forward to reading more. Your bloggy is super cute. I think it's great you want your kids to play the same sport you did. I was a swimmer, and for years I swore I'd never allow my kids to grow up to be swimmers. I'm terrified I'll try to live out my unfulfilled dreams through them. Unfortunately, they both LOVE swimming, and aren't too bad at it, so I'm just following their lead. BTW, I love hearing the conversations you have with your kids. I need to start writing down things that my kids say.